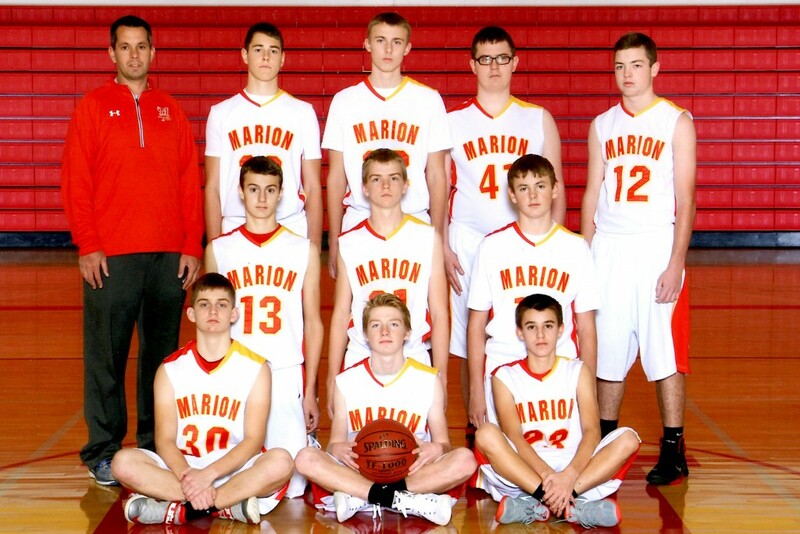 In hopes of giving you some ideas and possibly helping your team in some way, I’m sharing what we did with our sophomore (10th grade) boys basketball team this year. This includes our offense, defense, drills, plays, and so on. 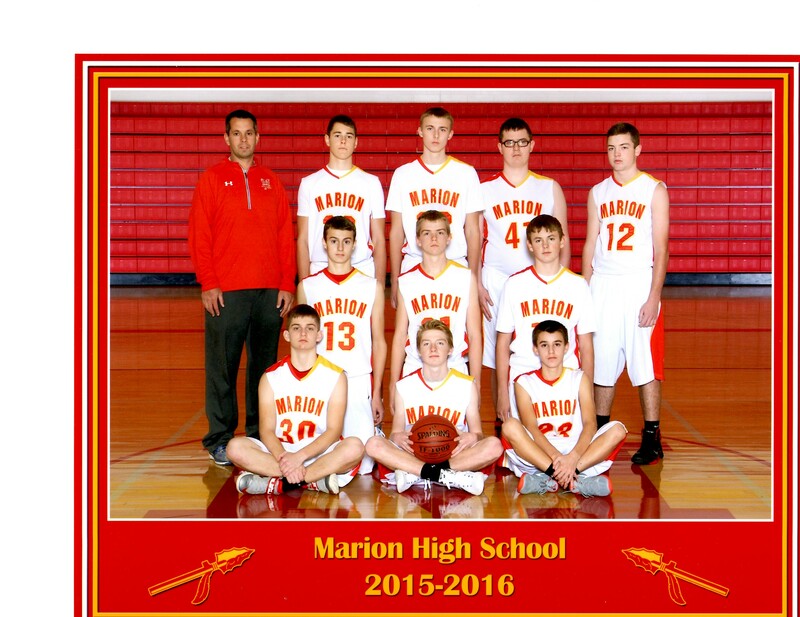 For the 2015/16 season I coached the Marion sophomore boys basketball team. It’s a 3A school in Marion, Iowa. The high school consists of around 620 students. Due to injury, players not going out, and players moving up… we had an unusually small roster. We only had 7 sophomores to start the season. After a week into the season we moved up 3 freshman. This gave us enough to compete yet we rarely had enough to play 5v5 in practice. We made it work. We lost our 2nd and 3rd games of the season. Then we went on an 18 game winning streak to finish the season 19-2!! Since this was a completely new team I didn’t have high expectations. In the back of my mind I would have been happy if we won half of our games. So going on an 18 game streak was a nice surprise! The season was very successful in my opinion. We won 19 games but more importantly all the players improved, had fun, got along, played extremely well together, and I hope they all learned some good life lessons. No one of the team averaged more than 8 points per game — and 7 different players averaged 4 or more points!! That is pretty incredible. It was a very balanced attack, sharing of the ball, and lots of teamwork. Probably the most balanced team I have ever coached. It made this season a lot of fun! We had 7 players average more than 4 points per game. And nobody averaged more than 8 points per game. It was very balanced scoring. The shots locations were also balanced. 28% of our shots were 3pt range. 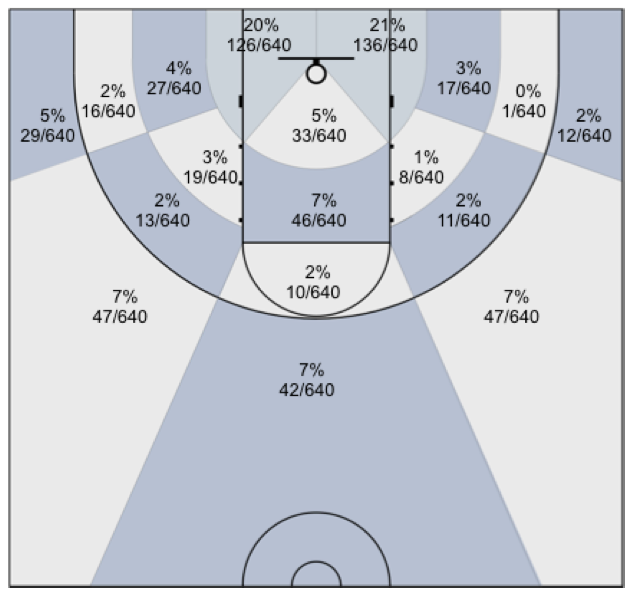 46% of our shots were lay ups or within 8 feet of the basket. And 26% of our shots were mid range. Pretty good balance in my opinion. Here’s a link to the transition offense we ran. Not much to it. Rarely practiced it. Just showed the transition a couple times. We ran when there were opportunities. But we didn’t push real hard since with our small roster we didn’t have much depth. Looking back, I gave players a lot of freedom. I never once specified who should take the ball out. They just figured it out and decided on their own who should take the ball out. I usually just gave guys a framework and objectives — then let them make decisions and figure things out. I was extremely happy with our motion offense. As sophomores it worked great for us and we still have plenty of things we can improve. I think having plenty of room to improve is a good thing and means your offense has plenty of upside. I loved the flexibility, effectiveness, and skill development aspects of the offense. Most people think a 5 out offense is for when you have lots of guards. We had several post players. We could post up as little or as much as we wanted. We could also take advantage of mismatches if we wanted. Or go to a permanent post at any time if we chose to (although we never really did). With two prototypical “post players” most coaches would probably think it’s nuts to run 5 out with both of them on the court. We did it anyway. I’m glad we did because they improved a ton with their confidence and skill with the ball. The first several games, they looked pretty shaky. Had some bad turnovers. But we lived with the mistakes and they were forced to figure things out. After a handful of games and their share of mistakes, they developed confidence and skill with the ball — and turnovers were not a problem for them whatsoever. I feel this was a great offense for skill development. The versatility was great and we spent most of our time in practice working on both skills and pieces of the offense at the same time. Our motion offense was really simple. They keys to the offense were skill development and the fundamental aspects of their spacing, cutting, screening, posting up, and so on. We literally taught the offense in 20 minutes. The rest of the season was spent working on both individual fundamentals and team offense fundamentals. We switched to a 4 out formation and put 1 player permanently in the short corner / post area. When players passed, instead of cutting all the way to the basket, they stopped in the middle looking for a gap (3 count) and then cleared to perimeter. Stopping in the middle and finding a gap. Out of habit players wanted to continue to the basket. Fill to the ball quickly and find good passing angles. We had to focus on this aspect — otherwise our ball movement stopped and the offense became stagnant. Really important emphasis point for us. Stay aggressive (attack the gaps — just play basketball). We never really practiced our zone offense since we didn’t have enough to go 5on5 or even have players that knew how to run zone defense. But it was simple enough where they could just learn during the games. It was a little rough at first but in time it worked well for us. We had a few simple set plays that worked as both quick hitters and entries into our motion. We didn’t run the plays very often. And we didn’t score with them very often (maybe 20% of the time). They usually just gave us a post up or ball reversal to kick-start our motion. Low – Super simple play we used at end of quarter and game situations. Pacer – This was my favorite play and I mostly used it against tough defensive teams. Running this play loosened up denial defenses and got us flowing right into our motion and avoiding turnovers. Also gave us our share of lay ups. Panther – Simple quick hitter that gave us ball reversal or quick post up. And flowed right into out motion. Dublin – Another simple quick hitter that gave us ball reversal, quick post up, 3pt shot, or flowed right into out motion. When running set (called) plays I wanted the plays to give us a great shot (lay up or post up) and also serve as an entry into our motion. I didn’t see a reason to run plays for jump shots since we can get those any time we want with our motion. To be honest, the only reason I added the third and fourth play was because they were new for me and I wanted to test them out. We didn’t need them. We ran 3 BLOB plays. They worked great. Probably scored an average of 8 points per game just off our inbounds plays. They were all from the box set. We disguised the plays with a numbering system and since they all started from the same formation, opponents didn’t know what we were going to do. We also had another play we ran against zone trying to pin the middle defender. Otherwise we just ran the plays about and told players to find gaps. You can find other good zone and man BLOB plays here. Stack – Traditional stack play. Indian – We used this when teams denied and pressured. Allowed us to get ball entered every time. We used this 3 across press breaker against zone presses. Worked great for us. If a team played man to man or even double teamed the ballhandler, we just cleared out. We did enough 1v2 dribbling drills so it was not a problem. Our guards on occasion would beat 3 defenders in the open court. If a team denied full court and we had trouble getting the ball in, we either used a 1 Up Press Break or Indian. We generally saved the Indian play for the last 3-4 minutes of the game when teams were denying full court and trying to get 5 second calls. Our opponents averaged 37 points per game. I wish I had better stats like our opponents EFG% and PPP… but coaching 3 different teams this year, I just didn’t have time to watch film and record those stats. Considering that we averaged 49 points, which is nothing off the charts, and our opponents averaged 37 points… I’d say our defense was pretty solid. We play 100% man to man defense. Almost always half court. We played a full court man to man press allowing the trail defender to trap on a few occasions. But 99% of the time we played half court man to man. We followed most of the fundamentals and concepts taught in this Jim Huber Defensive DVD set. Player straight up (no shading) when guarding the ball. When one pass away, closed stance with one hand a few inches behind the “line”. Not “in the line” but real close. 3/4 front in the post when ball is above free throw line. Full front with closed stance (forearm in the chest) when ball is below free throw line. Weakside help defender double teams on any post touch. Ball side perimeter player opens up to dig if needed, yet be close enough to get back out to stop the 3pt shot. We hedged all ball screens unless the screen was out of shooting range (24 feet or more from basket). In this case, the on-ball defender went under the screen. We really emphasized NO lay ups, keeping the ball out of the paint, moving on the flight of the ball, staying down in the defensive stance, and containing the dribble drive. Celebrate successes – high 5s, chest bumps. Selfless / help others. Servant leadership. I then might ask a couple other follow up questions. The players would respond and have good insight. They knew what they needed to do. Sometimes I’d even learn something from them. Then once they gave their thoughts I might add something or just say… “Ok. I agree. Everybody got it?” They would coach themselves and they could figure things out on their own. Honestly, when you put the ego aside, they didn’t really need me all that much. I’m just their coach. I can’t really do anything. They have to take all the shots, make the stops, and make the decisions on the court. I didn’t even get to score one point this year!!! 1v1 full court. Self explanatory I think. We just tried to use multiple areas to keep everyone active and working. Post and perimeter footwork. To get lots of reps, everyone had a ball and we usually did spin outs. I taught same footwork shown in the Attack & Counter DVDs. Competitive post 1v1 (after the pass and cut — or pass and screen). Many of the full court and post 1v1 drills can he found here. Rhythm shooting with partner. Start 8 feet from the basket. Take 8 shots. Then take one step back. Total of 40 shots. 2v2, 3v3, 4v4 with various rules and emphasis — ball screen attacks, screen away, post ups, full court rugby, no dribble, etc, etc. We used these drills quite a bit. Many of these drills can be found here. Free throw shooting. Shot an absolute minimum of 20 free throws per practice. Used all the baskets for efficient use of time.